I woke up to sunshine this Friday morning and, in an optimistic mood, headed down to the veg patch to do some sowing. Mr Fothergill's, a UK seed company, had sent me a selection from their new Get Growing and Optigrow ranges to trial this year including Nantes carrot seeds and seed tapes of Spinach 'Samish' - both can be direct sown in March so I thought "let's get on with it!" Mr Fothergill's David Domoney Get Growing range is new for this year and has been created to encourage anyone who is new to growing veg from seed. That might sound odd to seasoned gardeners but I've met many people who don't know where to begin, which seeds to choose or what to do with them. With clear printed instructions on the packet for sowing, growing and harvesting, plus advice and a QR code which links to more tips from David Domoney, anyone can hope for success. Sunshine turned to rain very quickly and four hours later I was back indoors, soaked through from the rain but feeling good from having had such a productive time in the garden. It was only after the rain started to come down quite heavily that I thought it best to call it a day. First job of the day was, as usual, to remove any tiny weeds from the beds - it really is the only way to keep on top of the problem, little and often - and then my thoughts turned to topping up the raised beds. I have to do this every year, it's amazing how quickly the soil levels sink with all those worms munching and pooping away. 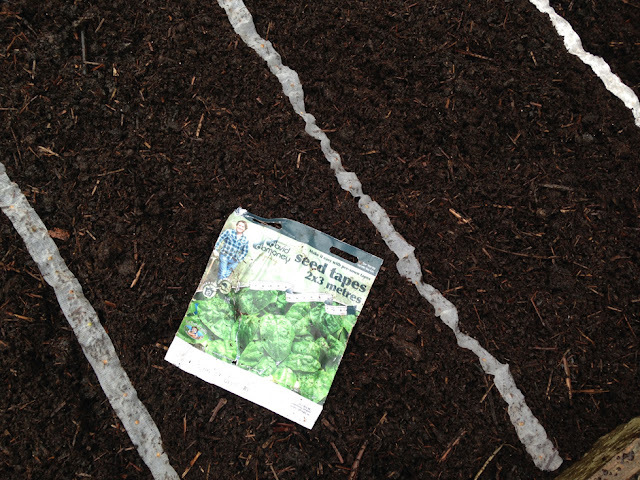 The plan today was to plant the spinach seed tapes, and intersperse with garlic (planted much too late but let's see what happens) and, in another bed, plant onion sets and intersperse those with rows of carrot seeds. In my experience, the onions mask the carrot scent and deter carrot root fly, a nasty pest that burrows into the young root to lay its eggs. Eeuww. Doesn't always work but has done for me. You can also put a 2ft/50cm high fine mesh barrier around the carrots as protection against these low flying beasties. I topped up the carrot/onion bed with ordinary multi-purpose compost. Not too rich, just enough nutrients for a month or so and deep enough for Nantes carrots which are a short early type. 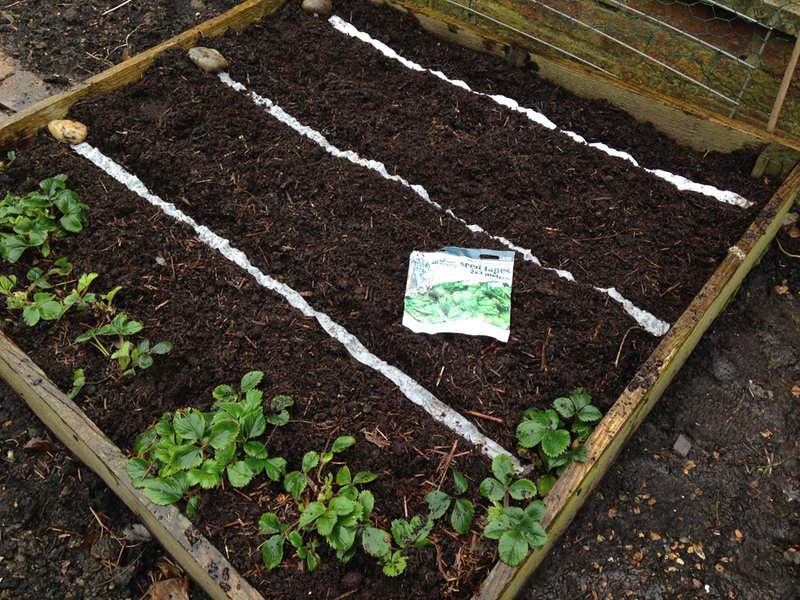 I've not used seed tapes before so I was keen to get the spinach tapes planted! 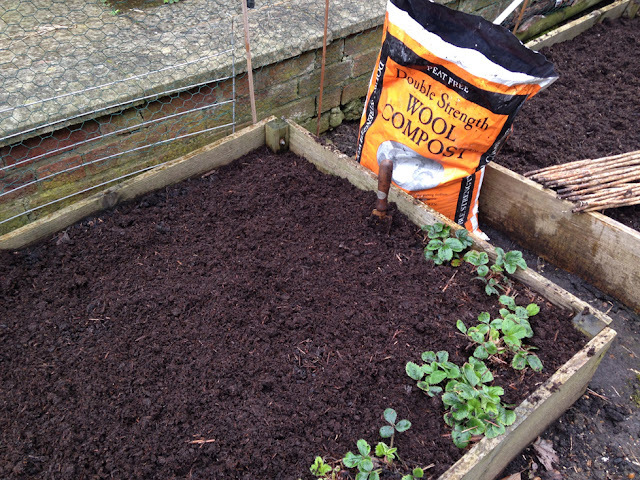 In this bed, I used a light mulch of Dalefoot's Double Strength Wool Compost to supplement last year's soil. Spinach likes soil to be nutrient dense and moist for a healthy crop and this particular compost from Dalefoot's comprehensive range will improve water retention as well as giving the soil a boost. The Strulch mulch from last year hadn't quite decomposed so I tickled the two mulches together before planting. No need to water as it had started to rain quite noticeably! The seed tapes were a revelation! The last thing I wanted to do with wet hands was to try and trickle a row of spinach seeds into a drill. With the tapes, all I had to do was anchor one end of the tape, roll it out into the little trench I'd made and cover it over. Job done! So quick and the instructions were very clear on spacing, depth, timings and how to do it. The advice is to harvest every other plant to allow the remaining plants room to grow; or cut and come again up to four cuts for baby leaves. I wondered whether it's the most economical way of growing spinach. The pack contained 6 metres of seeds across two 3 metre tapes; seeds are spaced roughly 1 inch apart on the tape, ie approximately 230 seeds for £2.99. This is slightly above the average cost but I imagine less seeds are wasted as they're pre-spaced for you. I planted three one metre rows today which should give me around 115 plants. That sounds a lot! Maybe two rows would have been enough. Germination should be in one to two weeks with first pickings in May so I'll plant another row of tape towards the end of April. I have to say I love the ease and speed of the seed tapes - with everything else that needs to be done at this time of year, it gets one box ticked off the list very efficiently. Other seeds from the Get Growing range that I've been sent are parsnip seed tapes which I'm thrilled about as I've never been able to grow parsnips before, some cherry tomato seeds that are for growing in pots and seed mats for 5 varieties of herbs to grow year round indoors. As a very keen herb grower, I'm excited about the seed mats and will be trialling those in pots on the balcony. All round, I feel this is a good range for newbie growers but let's see how the plants perform. I'll report back as and when but do give them a whirl if you're not sure where to start with veg growing ... even if you just have a windowsill or front door step; where the seeds can be grown - pots or direct sow outdoors - is clearly marked on the packet! Did anyone notice the purple cauliflower purée on the latest series of UK Masterchef? It was more creamy mauve than purple and judge John Torode said straightaway that he wasn't a fan of the colour; I have to agree, it did not look appealing, but I've read time and again recently that purple veg has been creeping up to the top of the superfood trend for the past year. I even had purple sweet potato patties at a vegetarian supper club recently which I thought was a novel concept but, blow me down, if I didn't find purple sweet potatoes at the supermarket at the weekend. So what is it with these so-called superfoods? Personally, I believe that eating any organically grown and freshly harvested food helps to maintain good health but, apparently, the deeper the colour of the food, the greater the nutrients within. 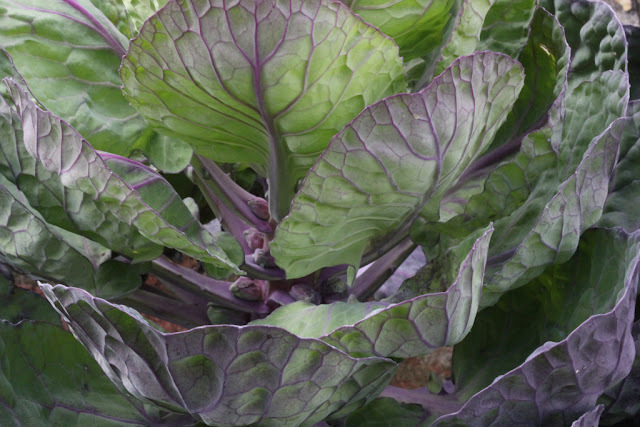 Scientists say that purple food contains very high levels of anthocyanins. These powerful anti-oxidants are known to combat free radicals in our bodies thereby boosting our immune systems and, in turn, reducing inflammation, keeping our hearts healthy and helping to fight the ageing process. It's also been found that regularly eating these foods can reduce the risk of getting high blood pressure and maintain good cholesterol levels. So far, so fabulous. However, it has to be said that eating a bowl of purple potatoes is not going balance out any unhealthy eating (hello, cheesy biscuits) but as I already grow - and eat - a rainbow of veg, I thought I'd take a look at which purple veg I've grown in the veg patch, enjoyed, and will grow again. 2. Purple carrots. I grew these a few years ago as a fun experiment and they were very tasty. Those had an orange core; this year I'm growing Purple Sun* which keeps its colour through to the core. All carrots were originally purple like this; orange carrots are a 16th century innovation. 3. As Purple Sprouting Broccoli turns green when cooked, I'm not sure that it counts, same for the purple beans I've grown (Blue Lake, Cosse Violette). I've got seeds for several varieties this year that will, in theory at least, give me a staggered crop from October to April next year. 4. Then there was my all time favourite for both looks and taste, purple brussels sprouts. (See top photo. Gorgeous.) These were a red ball sprout, the flavour is reckoned to be superior to green sprouts. And if you don't like sprouts, try stir frying them with bacon - you might change your mind. 5. Purple Pacific* asparagus, turns green on steaming. Pops up every year and is very delicious but doesn't seem to have multiplied at all - and I think one of the crowns may now be deceased. Last year I had a total of 15 stems over the entire season! Still, mustn't complain, they were very tasty with a poached egg. 6. Aubergine. So delicious in so many recipes; it's only the skin that's purple but it still counts. Baba Ganoush, anyone? Last year I grew baby aubergines, this year I have seeds for a compact aubergine 'Pinstripe' which can be container grown on my balcony. The velvety leaves and purple flowers don't look amiss in the flower border either. 7. Purple Potatoes. In 2013 I grew a purple skinned, purple fleshed potato called Vitelotte. What I failed to realise was that when you're choosing from over 80 varieties of heritage potato, it pays to make a note of the recommended use. Vitellote was deemed excellent for chips; not realising this, I boiled mine for mash with disastrously sloppy pale mauve results. Five years on and UK seed company Dobies are offering a purple potato that claims to be "ideal for mashing, baking, roasting, microwaving, crisps and chips". I'm still not entirely sold on the idea of purple mash on my cottage pie, or purple chips, although it would certainly be a talking point. 9. Purple Kohl Rabi - hadn't crossed my horticultural horizon until last summer. I now know it's a brassica, similar to a turnip or broccoli stem in flavour, but crunchy, mild and sweet. Apparently the purple is slower to grow than the green but I've ordered seeds and let's see! 10. Purple 'Shiraz'* snow peas. I always have mangetout growing in the veg patch as I use them a lot in cooking but have never grown purple ones before. I expect they taste the same, but with added nutrients, and there's a bonus of lovely bi-coloured flowers! Plus I can't resist eating the young pods raw. But the one thing that I haven't grown - and won't be anytime soon - is a purple cauliflower. So, anyone plumping for purple veg this year? * Note: Reading back through this post, I noticed that a lot of the veg I've mentioned (Redbor kale, Purple Sun carrots, Purple Pacific asparagus, Shiraz peas) can be sourced from one supplier - Dobies. One way to save on post and packing fees. For two days this week the weather here was gloriously uplifting - warm air and spring sunshine - and about time too, you might think! 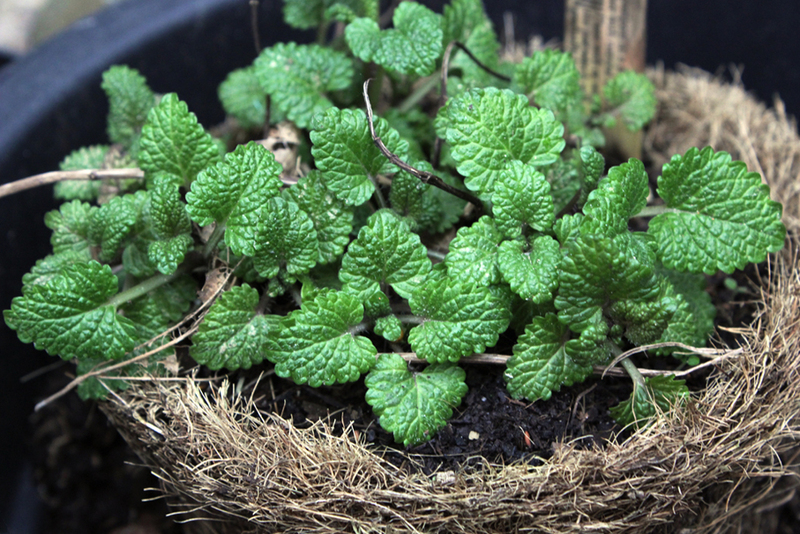 But with settling snow falling over London again today, I'm appreciating six herbs that seem to simply shrug off the worst of the winter weather. 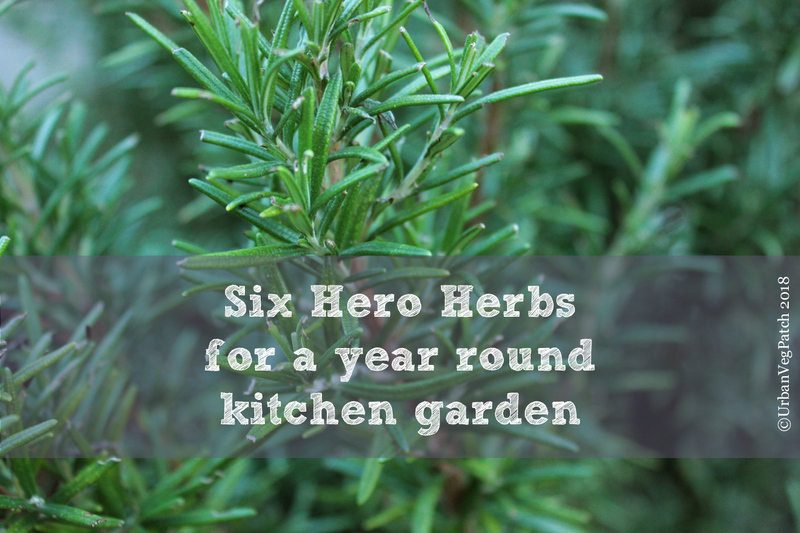 These six evergreen herbs can be grown on a windowsill, balcony, or garden and provide freshly picked flavours for my kitchen all year round. I confess I've never had much luck growing herbs indoors; there's simply not enough good light in my flat - it switches from shade to full sun or vice versa depending which window I'm looking out of. I'm lucky to have a small balcony though and if I didn't have that, I'd anchor planters onto the window sills. Of course I also have herbs in the veg patch garden but when it's cold and dark, it's much nicer just to reach through a door or window. Tried and tested over the years, I've successfully grown these particular kitchen herbs year round on my third floor balcony, with no extra heat or protection. This past week I've had to clear my balcony completely before it was thoroughly jet washed as part of ongoing building works so all plants have been temporarily removed to the garden downstairs for safety. They’ll withstand ice and snow but not the blast of a powerful water jet! So these are my six hero herbs; the trick with all of these is to make sure that the compost they’re in is kept just moist but well drained. Waterlogged or parched plants will not survive! With more vitamin C in its leaves than an orange, this is the herb I’m never without. The curly leaved variety is what I grow on my balcony. The seeds can be slow to germinate so I buy a supermarket herb and transfer it straight out of its pot and into good quality compost in a planter. It needs to acclimatise/recover from its hothouse start in life but, if the weather's warm enough, it can go straight outside. Watch out for those night time temps though! The roots are free to grow and the plant thrives. Parsley is biennial, so tries to flower in the second year, at which point I replace it. Assuming you like the taste of celery (I do), this is a perfect alternative to celery for the windowsill or container gardener. 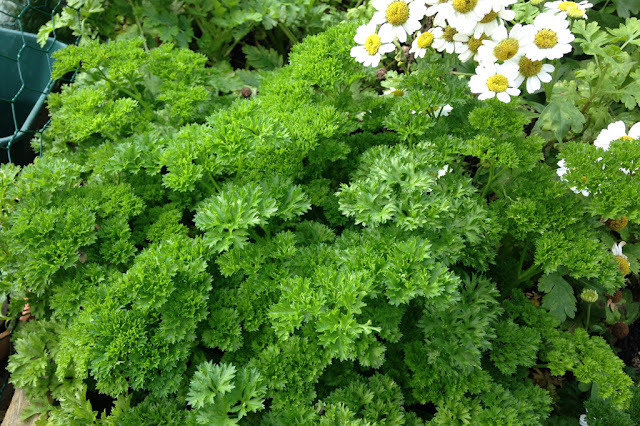 This biennial herb is hardy down to -12°C so will happily sit through all but the harshest winters. I add a few leaves to salad but mostly use it in stocks and soups. Edible seeds follow pretty spring time flowers and are delicious ground with sea salt when dried. Sow seeds in spring for a continuous crop. Over time, these can grow huge when planted in the ground so I prefer to keep mine contained in a pot to restrict its size. I bought a small lollipop bay some years ago, repotted it into a similar sized beautiful terracotta container and now replace the top inch of soil every year in spring. Bay likes its roots to be pot bound so it's a perfect container herb. 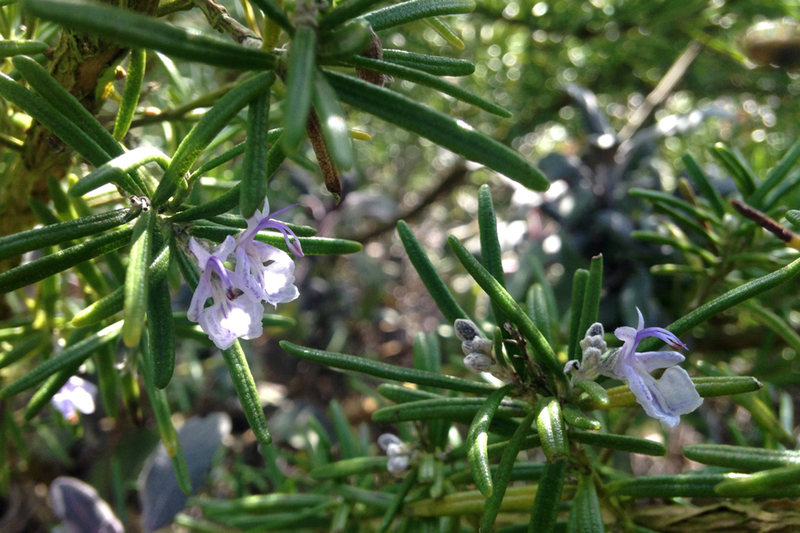 Adds a subtle flavour to casseroles, a classic addition to bouquet garni, and intriguingly good in rice pudding. I love having aromatic sages in the garden but, on my balcony, I grow Common Sage for cooking with. 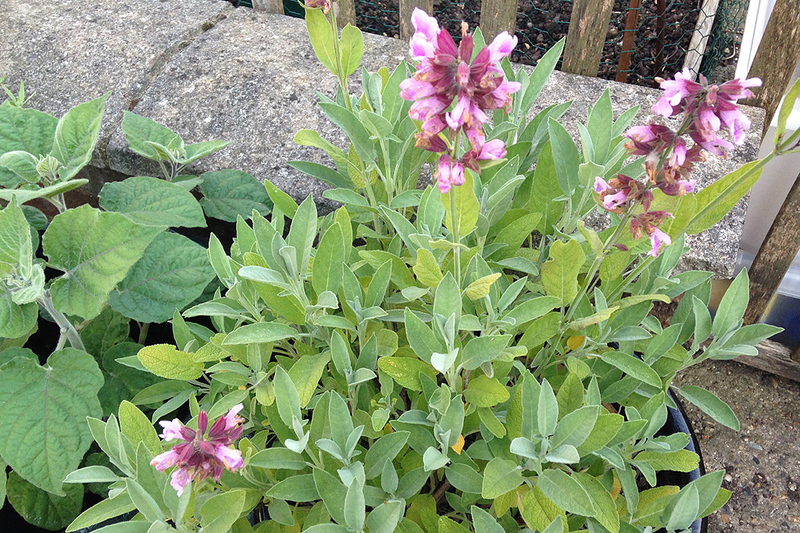 As a Mediterranean herb, it’s well suited to the rigours of life on the edge - the crosswinds of an urban balcony can be very damaging to plants - but sage, as with other grey/green or silver leaved plants, takes these conditions in its stride. Growing in a container keeps it at a manageable size, and it makes a tasty addition to vegetable dishes - I particularly love it with squash. It’s also reputed to have anti-aging properties, need I say more? It looks and smells amazing in a winter wreath but that’s not why I grow it. I have an Italian friend who makes a delicious pizza topped with thin slices of potato, chopped rosemary and cheese. It’s one of the classic ‘Scarborough Fair’ four and is excellent for aiding digestion which is why it’s so great with lamb or other fatty meats. It’s versatility extends beyond the kitchen and I love fresh sprigs steeped in warm almond oil to make a muscle soothing rub. 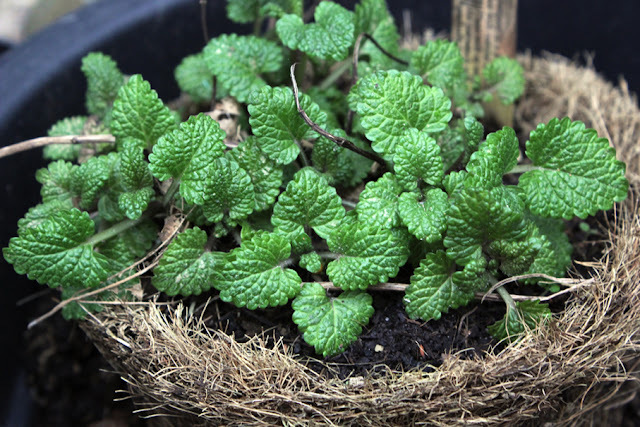 The natural habitat of this hardy evergreen herb is paths, rockeries and cliffs so it’s not only a classic culinary herb but perfectly suited to balcony or container life. 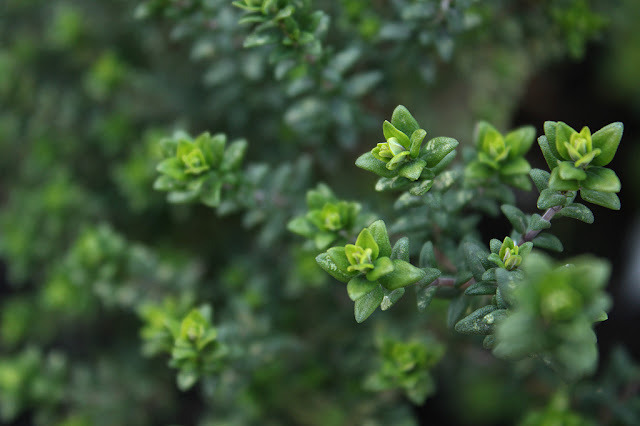 My favourite is the low growing creeping thyme in the veg patch garden which I pick from regularly; on my balcony, for ease of access, a small upright thyme is grown in the window box at the edge for maximum light. This summer I'll switch that out for an orange scented thyme (Thymus 'Fragrantissimus') which I've read is wonderful with sweet dishes, and possibly also cocktails! All thymes can be used for cooking but also medicinally - an infusion of the leaves makes a soothing tea for sore throats because of its antiseptic properties. Good soil is at the heart of every successful garden. 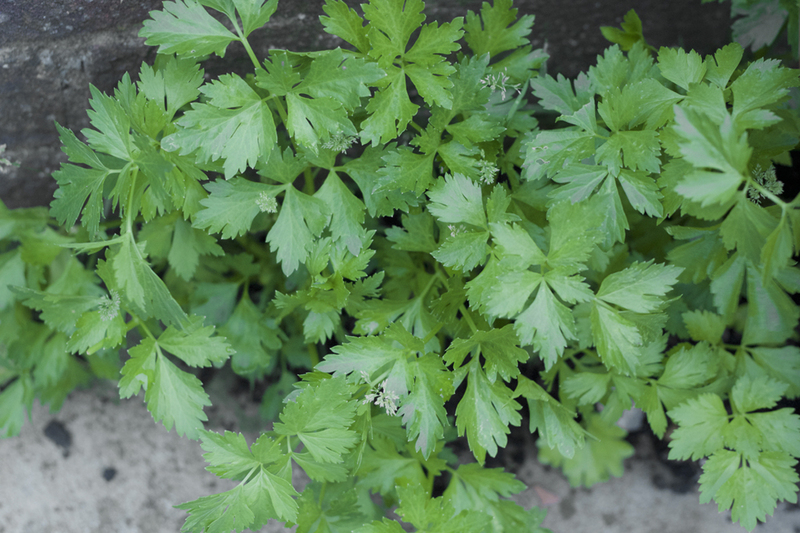 Because the substrate that I grow these container herbs is rarely changed, I use a soil based compost such as John Innes No.3 mixed with perlite for added drainage and, during spring and summer, water in an organic liquid fertiliser every few weeks. What are your hero herbs at this time of year? Dare I say that I'm moving on from winter? Too soon? I hope not. This time last week the garden was still under a couple of inches of snow and the wind froze water into long icicles on street signs. 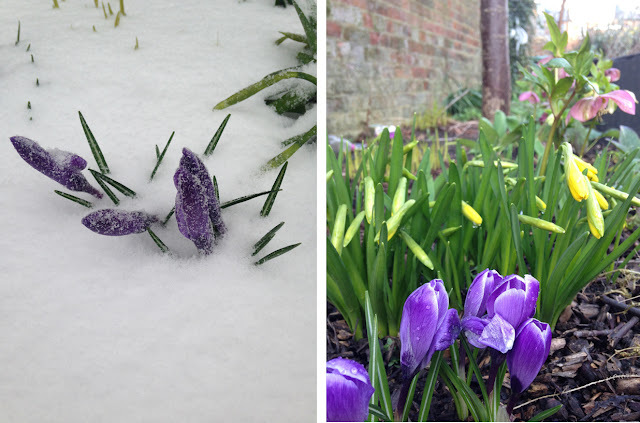 For London, that's very unusual - the last settled snow was in 2012. 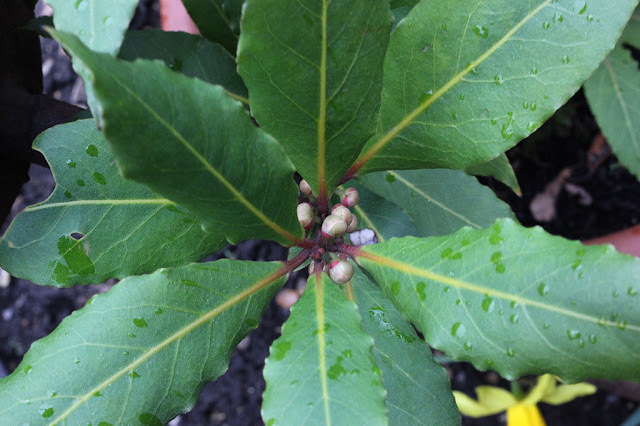 I didn't dare hope that open flowers or tender leaf buds on fruit trees would survive the big freeze but it seems that a week of winter followed by a few days of mild sunshine has kickstarted the garden into spring. So far I've identified only one casualty and that's a 3 year old pineapple sage. 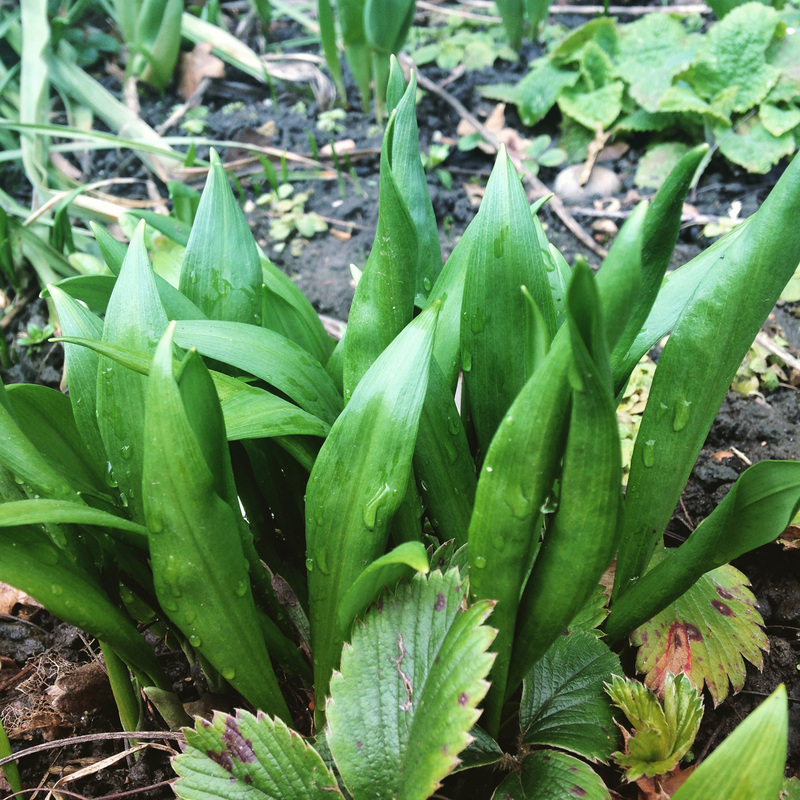 Being a half-hardy perennial, it really doesn't like temperatures to drop below 10ºC and, growing quite large, had been planted into the washing line/drought garden borders, ie, out in the open. Having now defrosted, it's now looking rather, well, dead. I'll probably need to replace it but will try pruning it to see if that promotes any new growth. Both my aromatic sages (Blackcurrant and pineapple) were bought as small plants in 9cm pots and quickly grew to several feet in size so I'm not feeling the loss too much. Bizarrely, the blackcurrant sage not far away in a corner of the veg patch seems to have survived, possibly because it has a low wall on two sides. At the northern end of the veg patch, tender scented pelargoniums will need to be pruned back but are also showing new growth in the shelter of the low wall. Such a small thing but it makes a big difference. Urban gardens and small spaces can often provide just enough warmth and shelter for less hardy plants to survive, even without a greenhouse. In the new garden where many of the plants are still in pots, I grouped the pots together in the shelter of a hedge to maximise chances of survival. It seems to have worked as my Mum's agapanthus have perked up along with herbs such as lemon balm, mint and celery leaf. Bay, of course, is reliably tough but even the quince-in-a-pot has got tiny buds about to unfurl. 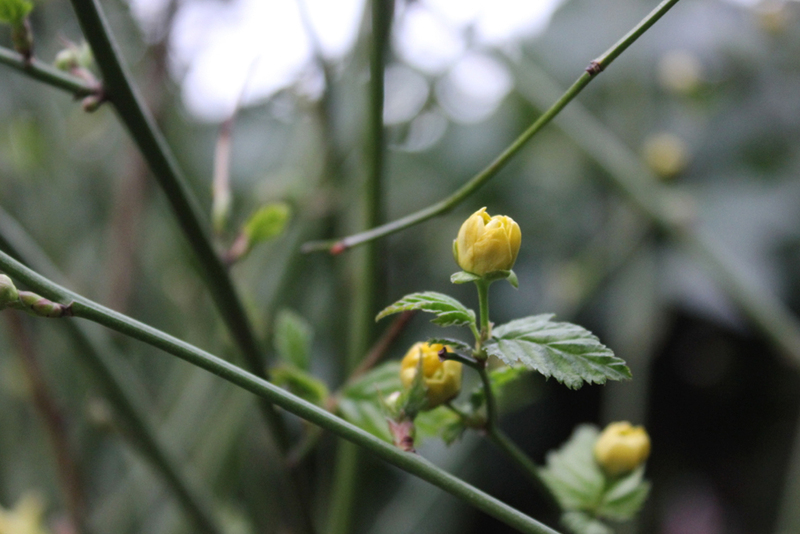 Tiny details but I can't help it, I still find it so exciting when the garden wakes up in spring! During the past week it's been lovely to see that hellebores, crocuses and daffodils have bounced back and I'm amazed at the speed that other plants have shown themselves. 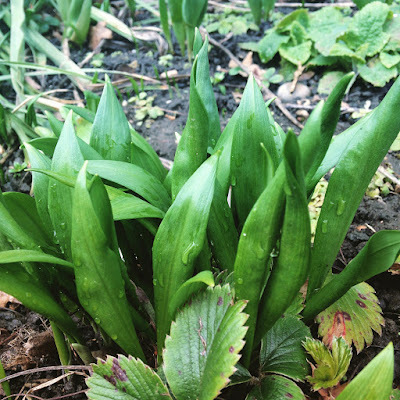 Wild garlic leaves are now about 3 inches tall (not long before they'll be added to pesto), broad bean seedlings have peeked above the soil and sweet pea seedlings, not there yesterday, are suddenly an inch tall. When did that happen!? It looks as though with just over a week to the spring equinox, winter might finally be moving on after one last lash of its icy tail. Perfect timing to start sowing some brassicas. What's everyone else up to in the garden this week?